There are three ways in which my situation of concern is manifesting. The diagram below, shows an overview of my situation of concern and the three sub-areas, which I will articulate below. This research is situated within the field of design and specifically the design of technology embedded within human activity systems. The aim is to explore the role of technology within societies, with specific emphasis on how these technologies affect human systems to evolve, grow and create solidarity. To do this, I will explore the fundamental ontological claims unacknowledged in traditional design methodologies and whether these assumptions still serve this role for technology today. The major area of concern in the design of technological systems is that they are embedded within a complex world, of multiple ontological narratives. This means that there are multiple ways of approaching the world, multiple ways of knowing and being. It is the role of technology to bridge these multiple narratives, in a synthetic and integrative manner; such that new worlds, new ontologies are born which act as common ground, in the creation of solidarity and shared practices. This research approach is distinctly Heideggerrian, in that it attempts to deconstruct the underlying ontological assumptions within technology design. In so doing, it attempts to reveal a more fundamental mode of design thinking; one found on what Heidegger called unconcealment. We will use Heidegger’s landmark paper, The Question Concerning Technology (1953) as the basic theoretical foundations of research. I aim to build on these concepts referencing two further works; Understanding Computers and Cognition (1987) and disclosing New Worlds (1997). These two texts build on the concepts of ontological design. The majority of the design of technology, we experience today is due to an overemphasizing of the task and an underestimating of the practices, which can be realized through technology. “design of practices and possibilities to be realized through artifacts.” The possibilities and new spheres of practice, which technology reveal to us are what we need to accentuate (Flores & Winograd, 1988). As explained above, technology is often built within a paradigm of instrumental rationality (Heidegger, 1977, pp 3–35), which means it takes an objective view of reality and most importantly places design as that process which manipulates resources to achieve its goals. The effect of such an instrumental technocracy leaves us separated from our role as disclosers of new worlds of being. “an extremely narrow philosophical anthropology which leads one to consider the user as a mere customer or, at best, as a human being framed by ergonomics and cognitive psychology; an outdated implicit epistemology of century; an overemphasis upon material shapes and qualities; a code of ethics originating in culture of business contracts and agreements; a cosmology restricted to the marketplace”. These misunderstandings in design have stemmed from the effect of product engineering and marketing on design, i.e. the determinism of instrumental reason and central role of the economic factor as the almost exclusive evaluation criterion, (Finelli, 2001). This in turn creates unwanted outcomes and harmful reflections of one self, society and systems. Currently, systems are designed from an objective base, which means, designing a system or product to meet business requirements exclusively. However, there is a greater need to inclusively design in a way that is grounded in human activity to gain a more holistic idea of what the citizen or users experience of what the system or product should entail. The practical problem here is to figure out what the process is for creating a social utility, which delivers both business value and most importantly citizen value. The platform is a computer literacy system for the citizens of the Western Cape; citizens must be able to easily learn how to use ICT (Information communication technologies) provided by the Western Cape Government. The platform will be designed with the purpose of fulfilling the citizens’ needs of Cape Access e-Centre’s, in rural areas placed across the Western Cape and the business needs of Cape Access programme stakeholders, who sit within the Department of the Premier. Following on from the practical problem; this way of designing is due to the fact that systems are designed from an objective point of view rather than being grounded in a human centered approach. As (Finelli, 2001) points out, we have become restricted by the culture of business in our artistic approach to designing systems and products, by placing more emphasis on the material shapes and identity. Ontological design implies different ways of understanding how we, as modern subjects ‘are’ and how we be who or what we are in the modern world. Simply put, we design our world, while our world acts back on us and designs us. (Willis, 2006) The tradition of ontological design emphasizes the role of the intervener or discloser as one who reveals new ontologies. Therefore, the experience of the designer is of critical importance. This is because the fundamental methodology of ontological inquiry is phenomenology. The fundamental methodology of design is to understand the phenomena of the experience itself and to use this to synthesize new ways of being. For this reason my research will engage into a phenomenological inquiry into design, around three practical projects, which involve the design of techno-social systems. The goal of this research is to shed light into the experience of ontological design, in the hopes of contributing in part to a new context of technology design. To create a design strategy for developing a system that is grounded in user-centered design process, which delivers both business value and citizen value. A learning platform for computer literacy and digital e-skills development, for the Western Cape Government’s Cape Access programme. My exploration lies in two roles; the role of the designer in the creation of technologically orientated human activity systems and the role of technology in creating new worlds or ontologies for citizens. How do we design for better network and conversation that enables new social paradigms of interaction? How do we prepare for future technological systems from which to liberate the potentiality of Being and how do we realize this through the many current and future technological artifacts? How do we deliver value to the citizens and create better possibilities and practices inclusively? I have sectioned my literature Review into seven sections; Ontology, Coordination or Style, Our Role as Disclosers, Commitment, Breakdown, Disclosing New Technologies, Designing Disclosure. Have a look at my problem statement here. Through this discourse I have aimed to bring two primary aspects into contrast and into accordance. The first is finding oneself within the design project – what is my purpose and role within the context of intervention. The second aspect is finding what is becoming within the area of intervention – this relies on sensitivity to a development trajectory or a historical movement into the future. With this we find the reasons and justification for creative action and emotional commitment. In this way we find a fundamental similarity between hermeneutic phenomenology and the design process – because we are engaged in a dialogue of sense making around basic ontological assumptions and epistemological machinery. Therefore the most fundamental aim of the designer is in the design of one’s own ontological structures, what Heidegger called a return to thinking (Heidegger, 1977). This is an ongoing and dynamic disposition to inquire into the ontological assumptions in which we operate. Through this inquiry we unearth how knowledge is created, or the epistemological implications of differing ontological foundations. This in turn leads to a deconstruction of style that facilitates the development of new ways of being – both individual and shared. In the final reckoning then the designer must aim to design oneself or architect within oneself the openness necessary to disclose new worlds. We could call this process, the design of ones own conceptual processes or the design of disclosure. Any opening of new possibilities closes others, and this is especially true of the introduction of technology. In providing a tool, we will change the nature of how people use the tool and the materials within it (Flores & Winograd, 1987). Technology in this broad sense imposes a framework or structure, through which we understand the world. In a sense, this treats all being as resource or inventory a status that covers over the being that is disclosed. (Heidegger, 1977) What Heidegger is saying, is in the modern world, we no longer experience being as it disclosed itself to earlier times of human beings. At all times, in history being has disclosed itself and also concealed itself meaning we understand some things and not others. Heidegger claims that in our age, there is this new threat to our understanding of being. He believed that Being was shrunk to what is present and the present moment is dependent on the minds ideas. Heidegger saw this as a problem because all understanding of being was dependent on a stagnant moment in an ever changing system, which led to false understanding and concepts being disclosed. Heidegger found that the philosophical tradition destroys the fact that being discloses itself or any possibility of thinking about that in any deep way. Our job, or way is to think that, without destroying or diminishing it. Heidegger (1977) does not mean we must overcome technology, he does not mean we must reject or destroy it. He rather reminds one that returning to the concealed truth that technology has covered over is what we need to be aware of. Heidegger acknowledges that technology is itself a creative act. Attending to the creative act of the invention of technology can be a way to understand what lies beneath the technology. Whenever something new is created we immediately get so concerned with the created artefact, or with the new technology, that we forget the being, that lies under it. The technology fascinates us and diverts our attention to pass over without noticing its origin. What we need is not the absence of technology, but sensitivity to what is originally being disclosed by the creation and use of the technology. Being itself must grant en-framing – Heidegger says our technological en-framing of the world, has itself been granted by being. Being has granted us remarkable new means, in which we are able to ignore new being, by which being is more and more obscured. In the very heart of our greatest mistakes – that is the place to look, Heidegger reminds us that it is our task to turn that moment into unconcealment. It is this space that we try to comprehend what we have forgotten and what is been concealed from us. Technology allows us to show each other our dreams, our imaginations or our experiences. As an example, we will look at computer gaming, Players are immersed and taking part in a series of activities, thought up by a team of humans who have imagined and co-created a world. Technology enables us to share our imagined structures with each other. It allows us a clear extension of communication, where we can allow others to experience what we are communicating rather than restricting our articulation to the boundaries of language. Technology now allows us to share much more of ourselves, and way of being. The heart of this work consists of coordinating human activity within a fold of experience – or ontology. I have sectioned my literature Review into seven sections; Ontology, Coordination or Style, Our Role as Disclosers, Commitment, Breakdown, Disclosing New Technologies, Designing Disclosure .Have a look at my problem statement here. Breakdowns play a fundamental role in design. The objects and properties that constitute the domain of action for a person are those that emerge in breakdown. In creating new artefacts, equipment, buildings and organizational structures – attempts to specify in advance how and where breakdowns will show up in our everyday practices and tools we use, opening up new spaces in which we can work and play (Winograd & Flores, 1987). A breakdown is not a negative situation to be avoided, but a situation of non-obviousness, in which the recognition that something is missing leads to concealing (generating through our declarations) some aspect of the network of tools that we are engaged in using. A breakdown reveals the connections of relations necessary for us to accomplish our task and this shows a clear objective for design – to anticipate and be sensitive to the forms of breakdown and provide a space of possibilities for action when they occur. I have sectioned my literature Review into seven sections; Ontology, Coordination or Style, Our Role as Disclosers, Commitment, Breakdown, Disclosing New Technologies, Designing Disclosure.Have a look at my problem statement here. We are the way we are because occurrences have led us to make a commitment to some cause, person, or role with an intensity that we cannot establish in any shared terms. These two different accounts of identity seem radically opposed. One says that our sense of identity depends on others and the other says that it depends solely on the intensity of our individual commitment(Flores, Spinosa, & Dreyfus, 1998). For Heidegger, we always remain subject to the public norms of intelligibility. It is the public view or they that we are trying to change through our commitment. Consequently, the public view can change in such a way as to make our commitment irrelevant. It is this possibility that we are always sensitive to which enables us to position ourselves. What we call our identity is split into two different functions: we see ourselves through the eyes of others, and determine which actions position us in the way that gives us the most credibility – while also interpreting which actions make the best sense of our commitment. Our positioning operates only on the basis of our commitment, so it can only cause us to give up our commitment if it has become entirely irrelevant or hopeless. Communication is not a process of transmitting information and symbols, but one of commitment and interpretation (Winograd & Flores, 1987). We have to interpret what to do to manifest the commitment truly. Since, we are always also trying to make our commitment make sense to others and ourselves, we must manage the way we position our actions.Our sense of being over committed is precisely how we today experience the risk of living in the recognition of others(Flores, Spinosa, & Dreyfus, 1998). This realisation of ourselves as disclosers is one of great importance, because we can disclose very important structures of our existence; of what it truly means to be human – but what does this realisation mean actually? To understand our role as disclosers is to acknowledge that the basic structure of our existence is to disclose new worlds – that is to bring about new practices, concepts and ways of being. Through this disclosive process we also find fundamental structures of meaning in existence such as purpose, identity and will. This is to say that in finding ourselves in our situatedness, in our being-there we also find what the world is calling us to do, and how it is asking us to take action. To be authentic then is to engage in this dialogue with ourselves, our history and the world in which we are embedded; and to then act purposefully. This purposeful action can only be found with the central realisation as our role as disclosers. We do not normally sense that we are disclosers because we are interested in the things we disclose and not in the disclosing (Flores, Spinosa, & Dreyfus, 1998). If we shift our focus rather on the process of disclosure itself, we may possibly find a far more richer and purposeful existence and with this the capacity to disclose worlds which are relevant, plausible and contextually viable. The point here is a somewhat subtle one – it is not that we are not disclosers (for that is undeniable), but rather it is that we are not aware of the ontological structures in which we disclose. Ontological designing then is a design process, which is aimed at unearthing the basic ontological structures of a context; and in this deconstruction finding the basic processes for the emergence of a new ontological structure. Heidegger claims that a hallmark of Western disclosure has been one of dominance – that is to say that our disposition to the world around us is one of exploitation. This is the belief that we are configurations of power, that our focus has been on an expression where we seek to dominate being, rather than to understand it. This in turn, blocks off human sensitivity to the way life and situations are changing all the time; that we become unaware of our role as disclosers of being and instead supplant this role to one of dominance. The attempt has always been to put our humanness in the center– not Being itself and thereby trying to gain a kind of conceptual control over Being. This falsely portrays us as subject to human creations where we think of Being as something, which we have control over. Heidegger (Heidegger, 1932) sees all form of philosophical thought as human-centred and anthropocentric, which he claims is where we have gone wrong. Therefore in Heidegger’s later works he proposes that the role of the discloser is to allow Being to disclose itself in itself rather than to attempt to impose our will upon it. Heidegger ( 1996) claims that most of us live, according to the They, rather than according to our own authentic phenomena of existence. The They refers to the way we identify ourselves with what others or the public culture thinks about us (what ever they think) or simply put, what concepts we compare ourselves to. This also relates to objects of desire, which we want or are after (such as money and material things). Heidegger calls this the das Man self, which we may understand as an set of names, categories and labels, for example, “ I am a student”, or “I am wealthy” etc. The problem is that this conception of our self is inauthentic, in that it is not based on our historicity, our being-there. To find our authenticity then is exactly the opposite, to find ourselves (our being) in time (our history) – what Heidegger calls Dasein or the essential structure of existence. In this way ontological designing begins with the question of being – not only who I am (our authenticity); but also what is asking to become. This last point is founded on an acknowledgement of the nature of Being as becoming – what we may call the second question of being: what is becoming? It is these two aspects of being ontological that are at the heart of the realisation of our role as disclosers. With this we find purpose and meaning, in that we disclose what action we must take. This commitment is the necessary condition for disclosing new worlds and new ways of being (Spinosa et al., 2007); further this commitment can only be fostered through a invention within identity. Our way of being, or style is the basic understanding of human activity and experience. Style acts as the grounding from which practices are maintained and also the platform from which new practices are developed (Flores, Spinosa, & Dreyfus, 1998) Our way of being, deals with its surroundings through learning and perceiving patterns of interlocking meaning, then applying this to the activity at hand – for example, walking, thinking, driving, or conversation. We often do not notice ourselves as agents, as people, or as any thing in these activities. Once we become habituated to a style, it becomes invisible to us (Flores, Spinosa, & Dreyfus, 1998). From a Heideggerrian perspective is called throwness, which means that our basic engagement in the world is not of reflection – that we are not rational and reflective which engaged in the world. Rather reflection occurs in breakdown of this throwness, which is an encounter with the uncertainty of experience. In this breakdown we must make sense, reflect and create concepts that allow us to cope or adapt. What needs to be done, said or thought of straightaway draws an appropriate response form us. We respond to a situation that appears in terms of the actions we need take. It is only at the unexpected moment when something does not go according to expectation that we begin to experience disharmony (breakdown) that we begin to call upon different ways of being, or different patterns to figure out how to deal with the unexpected. “ We see things as odd artefacts until we become familiar with their use, and then we become virtually incapable of seeing them as strange (Flores, Spinosa, & Dreyfus, 1998)”. Through being present to this disharmony or breakdown, we can get a sense of how this system is dynamic and changing – that is to say that we can begin to understand how it is attempting to evolve. To elaborate here, two things “show up” in this breakdown. Firstly the breakdown discloses coordination, it unearths the roots of sense so to speak which instantiates the system itself. Secondly it points out the areas in which the system is failing, and shows these as the exact places in which change or development must occur. These two points are the basic points of departure for ontological design because it shows a breakdown in the hermeneutic machinery and also gives and indication of the development trajectory of the system. The next question is to figure out how to facilitate the emergence of a new style – this requires the ability to work with the above two points as the actual foundation for design. This skill for dealing with a disharmony or discordance is more complex than the skill for noticing and holding on to it. Spinosa et al. (2007) suggest that there are three ways one can do this, namely articulation, reconfiguration and cross-appropriation. We distinguish two aspects of a disclosive space: it’s organization and it’s coordination. In order for things and selves to show up as meaningful (as opposed to just effective) this organized activity needs further organization called coordination (Flores, Spinosa, & Dreyfus, 1998). In the articulation of change, the style crystalizes the core identity and becomes more recognizable in its pure form, for what it actually is. Reconfiguration is a more substantial way in which a style can change. In this case some marginal aspect of practices coordinated by a style becomes dominant. Cross-appropriation takes place when one disclosive space takes over from another disclosive space, a practice that it could not generate on its own but what it finds useful. Articulation, reconfiguration and cross-appropriation are three different ways in which, disclosive skills can work to bring about meaningful historical change, of a disclosive space. All of these types of change are historical because people sense them as continuous with the past (Flores, Spinosa, & Dreyfus, 1998). These three ways in which disclosing may be historical – or may produce changes in coordination of practices – leads us to the investigation into being sensitive to the disclosing that one is carrying on in one’s life, which we call disclosing, that one is a discloser (Flores, Spinosa, & Dreyfus, 1998). Ontology refers to the meaning of being or existence itself. To describe ontology clearly, we will use an Heideggerian lens to grasp its fundamental concept. Heidegger, is interested in what it means for entities to exist, he is interested in modes of being, or existence. In Being and Time ( 1996) Martin Heidegger talks about what it means to exist, in a sense he looks at existence as an activity – our mode of being, or mode of existence. He believes that human existence is open to, vulnerable to and defined in relation to the world surrounding it. Heidegger says that being-in-the-world, means the world is a part of our beings existential structure, it is the projection of possibilities based upon a history of experience. In this way we always understand things through experience, at this level, things, which are revealed to us, are believed to be true. What we understand is based on what we already know, and what we already know comes from being able to understand (Winograd & Flores, 1987). Spinosa, Flores and Dreyfus (1997) in their book Disclosing New Worlds describe all pragmatic activity as being organized by a style. Style is our name for the way all the practices ultimately fit together, (Spinosa et al.,1997)claim that a style is not an aspect of things, people, or activity but, rather, constitutes them as what they are. A world for Heidegger, has three characteristics; Inclusively non-related pieces of equipment, which are used to perform a specific task. These tasks achieve certain purposes, which enables those performing them to have identities. These identities are the meaning or point of engaging in these activities (Flores, Spinosa, & Dreyfus, 1998). This view of the world as interpretation (from a distinctly Heideggerrian perspective) is called Hermeneutic Phenomenology. This is an appropriate ontological stance for our investigation because it is interested in ontological design. This means we are specifically engaged in designing bridges between multiple and varied ontological stances in a synthetic and integrative manner. The task of the ontological designer then is to disclose worlds, which are based on shared sense making or shared hermeneutic foundations. To explore this further we operate within the world based on a basic hermeneutic process or sense making. This ‘way’ of making sense of things and experience is what determines the way we act within that world – we can call this the style in which we act in the world. Therefore in ontological designing we are interested in unearthing the sense generating machinery between differing ontological stances; and through that difference disclose new possibilities for being. The major area of concern in the design of technological systems is that they are embedded within a complex world, of multiple ontological narratives. This means that there are multiple ways of approaching the world, multiple ways of knowing and being. It is the role of technology to bridge these multiple narratives, in a synthetic and integrative manner; such that new worlds, new ontologies are born which act as common ground, in the creation of solidarity and shares praxis. Although it is proposed here that this is the highest form of technological design, for the most part, technologies do not fulfill this purpose. In reading this it has shifted my view from merely looking at designing artifacts of interaction, to rather designing possibilities (new worlds) and practices (ontologies) for human beings. Technology is built within a paradigm of instrumental rationality, which means it takes an objective view of reality and most importantly places design as that process which manipulates resources to achieve its goals. The effect of such an instrumental technocracy leaves us separated from our role as disclosers of new worlds of being. Design is meant to serve as a lens to imagine possibilities, to be the bridge between precognition and experience or a way in which we disclose new experiences. Similar to Flores and Winograd, Findelli points out that our focus in design sprouts from the wrong basis, which in turn creates unwanted outcomes and harmful reflections of one self, society and systems. It is a new way of experiencing and imagining that we need to address to prevent thinking in the same loop of destruction. A change in perspective is needed to break free from the loop of observation of subject and creation f what the subject has asked for, because these methods are not creating solutions but are repeating the same issues. This research approach is distinctly Heidegerrian, in that it attempts to deconstruct the underlying ontological assumptions within technology design. In so doing it attempts to reveal a more fundamental mode of design thinking; one found on what Heidegger called unconcealment. We will use Heidegger’s landmark paper, The Question Concerning Technology (1953) as the basic theoretical foundations of research. I aim to build on these concepts referencing two further works; Understanding Computers and Cognition (1987) and disclosing New Worlds (1997). These two texts build on the concepts of ontological design. Ontological design implies different ways of understanding how we, as modern subjects ‘are’ and how we be who or what we are in the modern world. Simply put, we design our world, while our world acts back on us and designs us. (Willis, 2006)The tradition of ontological design emphasizes the role of the intervener or discloser as one who reveals new ontologies. Therefore the experience of the designer is of critical importance. This is because the fundamental methodology of ontological inquiry is phenomenology. The fundamental methodology of design is to understand the phenomena of the experience itself and to use this to synthesize new ways of being. For this reason my research will engage into a phenomenological inquiry into design around three practical projects, which involve the design of techno-social systems. The goal of this research is to shed light into the experience of ontological design, in the hopes of contributing in part to a new context of technology design. 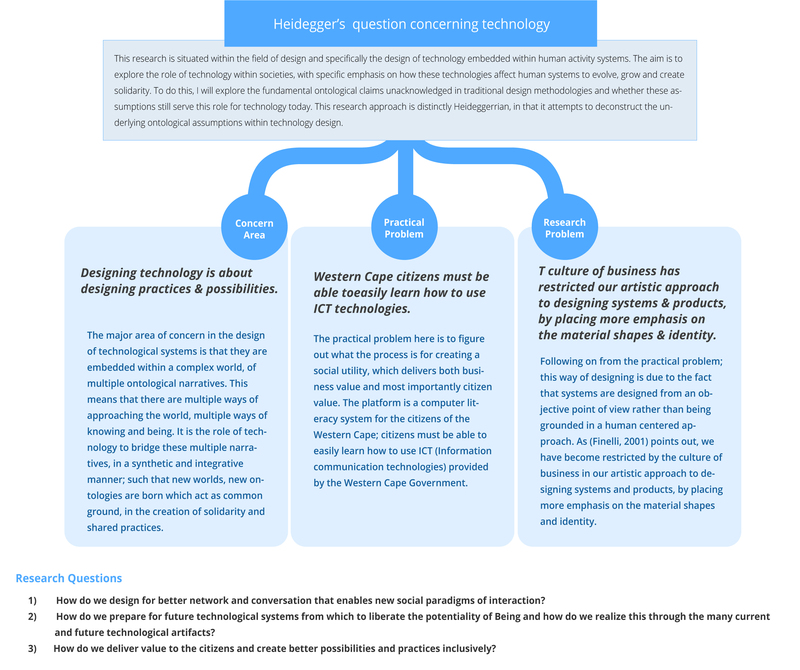 There are two major, practical dimensions I would like to explore here: My work as a Usability Architect for the Western Cape government, where the focus is on e-Government for citizens and working with Ownpower consulting on the investigation of a Learning management system (LMS) and a Skills intelligence platform (SIP). Last night a I read this paper by Fernando Flores, it was incredible insightful with regards to understanding how we use technology to define our own identities as well as understanding those around us through their made up identities. In this blog post, I will quote parts of his paper and aim to draw out how he has made me re-look and re-think how I view digital public spaces. We claimed that computers were essentially for communication, not computation. On that basis, we also predicted that computers would come to be used for coordinating action and, in that way, help us to see that the heart of commercial activity was the use of language to coordinate action. The first line in this quote, made me think of how we have changed in our communication habits or mechanisms. I thought back to a project I did in my undergrad, the main underlying concept was to prove how technology is based on nature. I showed a series of natural organisms in their natural state and technological systems and from a visual point of view revealed the overlapping and underlying patterns which allowed both of these systems to run successfully. It became apparent in this project that, it seemed that we were moving towards a mimicking age, where opposite forces were mirroring each other as we travel parallel to one another, both constantly communicating one another. I looked in depth at the underlying fractal pattern as the base language for a computational system of an animated fractal – which I coded in flash, actionscript. The rules were simple, Rotate 30 degrees, on every rotation add a line. I also juxtaposed coded space invaders onto a video clip from a nature documentary, showing aquatic insects flying. The resemblance spoke for itself. Jared Tarbell has been on my list of favourite artists for many years, his work best describes the above mentioned project and visualises it beautifuly. This basic observation, made me re-look at technological systems which I use today, my main action is communication through all of them. Companies and individuals need identities that matter. And that is what we are losing today both by virtue of our ability to manage commitments well and by new social practices which are proliferating new institutions, especially those developed in the World Wide Web. Information depended for its sense on communication, and just as communication was about coordinating action, that is what computers would come to be about. Likewise, it is generally right to see that the World Wide Web is about producing networks of individuals (virtual communities) but I want to stress that such networks are not autonomous. They depend for their sense on individual and corporate identities, which require maintaining identity defining commitments or, as the philosophic tradition following Kierkegaard calls them, existential stands. Consequently, just as computers are coming more and more to be involved in communication, the Web will come to be more and more the medium for building identities. Virtual communities and virtual worlds where people can live, is definitely rising into a fascinating mental area. I have been fascinated with the behaviour Whatsapp has caused among people I have been sharing digital spaces with. What interests me is how people change their tone, and mental processing while communicating. I think this has largely sprung from the mobile device itself. Mobile has allowed us to have a digital space that moves around where ever we go. It is our own personal reflection which we use to define ourselves, constantly, at every point in time. You always find it in very close proximity to ourselves.It has become so integrated in our daily actions, that not many conversations go by with out a mobile phone being involved at some point. Back onto the topic of Whatsapp. It has evolved instant messaging to conscious thought almost. It is treated on the same level of telepathy in a way. It is an abstract message which is so far removed from our natural senses, that we have related it to ether. It is almost as if, if something does not pass through our senses it is transformed into the magical abstract etherial level. What I love about this new form of mental communication is how it has made us more intimate. There have been claims that technology has made us a lot more alone or lonely , I strongly disagree with this, I believe that our communication has just become more ingrained with technology and it allows us to communicate more truly instead of being stuck behind the construct of language. I think that this lack of construct allows us to relate to ourselves on a deeper base level, which allows ourselves to resonate closer to our authentic selves, or does it ? • to describe the result of an individual’s commitment to whatever person or cause gives meaning and direction to that person’s life so that without it he or she would find life desperate, disoriented, in short, not worth living. I had a great conversation similar to this paragraph with a friend. We were talking about ego. First we started chatting about how we understand one another, and figured that we were having the conversation and were resonating with subjects due to similar experiences previously shared. It made me think of when we listen to one another, we listen from within ourselves and wait till we can grasp onto something that we have knowledge on or experience with and then add to it. We stack up these experiences so that we can understand ourselves and others . It made me understand why it is important to have an ego because it gives us an axis point to understand the rest of the points on the cartesian plane. But until the breaking point has come, we experience in our day-to-day actions our commitment to who we are as total. Our commitment determines what counts as valuable and meaningful in our world. We would not change our identity on the basis of what others think. We judge public standards by the private values created by our commitment. It defines our world, our frame of reference. It might seem as though such a conception of identity applies only to people. But one of the most important business review articles of the last decade calls companies to identify and focus resources on the core competencies that for various contingent reasons they have come to possess (Hamel and Prahalad, 1994). The point is to develop the companies’ uniqueness. It is always the underlying question, in design, what is it’s unique selling point and how do we incorporate that understanding into a brand essence which can determine the expereince of the product. I find it interesting that this feels like we are personifying brands, products and systems. Similarly, with user experience design, we try to create a personality or identity which people can comprehend easily so they can relate to what they see in front of them. It’s fascinating that one end we are trying to automate everything and on the other hand we are trying to personify the automation as much as possible. We are who we are because of the response we have made to the way we have been recognized. And we are the way we are because circumstances have led us to make a commitment to some cause, person, or role with an intensity that we cannot justify in any shared terms. These two different accounts of identity seem radically opposed. One says that our sense of identity depends on others and the other says that it depends solely on the intensity of our individual commitment.